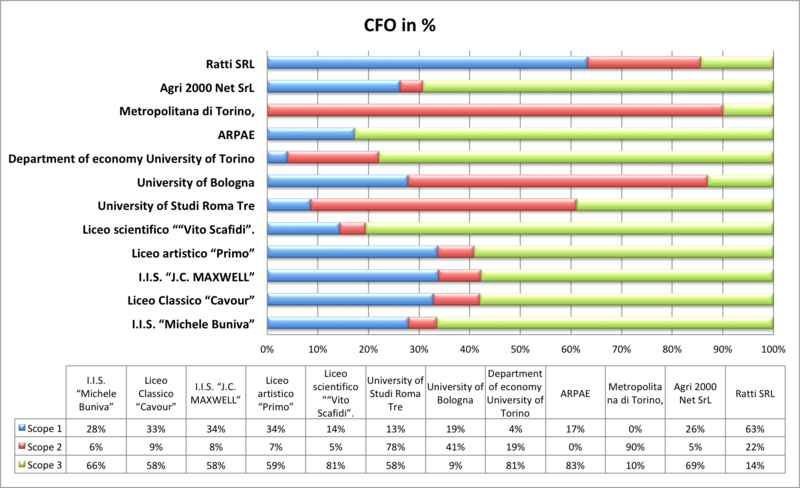 9 organizations have used the ISO 14064, whereas the other 10 have applied the GHG protocol to develop their CFO. As far as the scopes selection is concerned, just 4 organizations have analysed only scope 1 and 2. The others 15 have adopted the most complete approach. Thus they have considered the most relevant indirect emissions too such as materials in input, home-work transport, good transport, business travels, waste and capitals good, in order to obtain a more complete picture of their carbon footprint. All organizations which completed the CFO calculation have identified a set of potential mitigation actions. Some of them have started the implementation of such actions. For some others an assessment of potential benefits associated to the identified actions was performed and an internal evaluation about the effective implementation is ongoing.Ecoinnovazione and ENEA have strongly supported the organizations through several meetings (including webconferences). Overall, the experimentation has given valuable feedback for the further development of EFs Databases, as it has highlighted future needs in terms of EFs development and economic sectors coverage by the national and Clim’foot Databases. Moreover, one of the involved organizations required for a more detailed study, which was used to cross-check the CFO results, thus providing further valuable feedback on the Clim’foot database robusteness. In the public sector for 8 organizations, that have consider scope 3 too, the transport of people from home to school/work and return is the main source of CO2eq with an impact from 77% of total CO2eq emission until 33%. Another important categories are Indirect emissions from electricity consumption and Indirect emissions from steam, heat or cooling consumption (scope 2) with impact until 34% of total impact, this is due to use of network heating; the capital goods with impact until 33% of the total impact, this is due to the building and IT device. In the other 2 public organizations, that have considered only scope 1 and 2, the Indirect emissions from electricity consumption and Indirect emissions from network energy consumption are the main impact. After the calculation of CFO, 13 organizations have defined several mitigation actions, mainly for the reduction of energy consumption (heating or operational machine) and for encourage the sustainability mobility of the employs and clients. Moreovery the end of the Clim’Foot project, one Action Plan was developed by School of Economy and management, University Torino and one Sustainability Report was developed by Ratty S.p.A. The sustainability report presents the policy and actions developed by Ratti group to improve their social and environmental sustainability, including the environmental benefit reached by the organization with the implementation of mitigation actions to reduce the CFO. Return to the main menu on the voluntary programs in the Clim'Foot project.